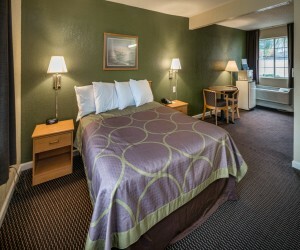 Our Non-Smoking 1 King Bed Room at Hotel Rose Garden is a perfect lodging option for couples visiting San Jose. 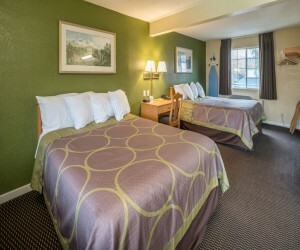 This spacious air-conditioned room includes a comfortable King size bed with plush bedding. This is a Non-Smoking room. The 1 King Bed Room features a Flatscreen TV with HBO, microwave, fridge, and free WiFi and a desk with alarm clock. This room type features a private full bathroom with either shower or tub, hairdryer, and complimentary toiletries and plush towels. Your stay includes a complimentary continental breakfast. 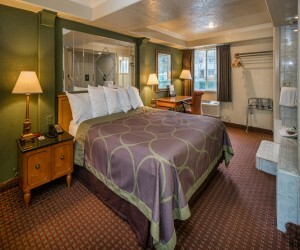 Our 1 King Bed Room at Hotel Rose Garden is a perfect lodging option for couples visiting San Jose. 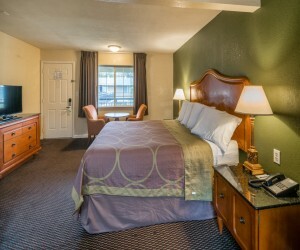 This spacious air-conditioned room includes a comfortable King size bed with plush bedding. Smoking is permitted in this room. The room features a Flatscreen TV with HBO, microwave, fridge, and free WiFi and a desk with alarm clock. This room type features a private full bathroom with either shower or tub, hairdryer, and complimentary toiletries and plush towels. Your stay includes a complimentary continental breakfast. Our air-conditioned 2 Queen Bed Room at Hotel Rose Garden is our most spacious accommodation and is perfect for families or groups. This large room includes two comfortable queen size beds with plush bedding and can easily accomodate 4 adults. The room features a Flatscreen TV with HBO, microwave, fridge, and free WiFi and a desk with alarm clock. This room type features a private full bathroom with either shower or tub, hairdryer, and complimentary toiletries and plush towels. Your stay includes a complimentary continental breakfast. Our air-conditioned 2 Queen Bed Room at Hotel Rose Garden is our most spacious accommodation and is perfect for families or groups. This large room includes two comfortable queen size beds with plush bedding and can easily accomodate 4 adults. This room permits smoking in-room. The room features a Flatscreen TV with HBO, microwave, fridge, and free WiFi and a desk with alarm clock. This room type features a private full bathroom with either shower or tub, hairdryer, and complimentary toiletries and plush towels. Your stay includes a complimentary continental breakfast. Our air-conditioned 1 Queen Bed Room Handicap at Hotel Rose Garden is our most accessible accommodation offering ADA compliant features for handicap access. This spacious non-smoking room includes a comfortable queen size bed with plush bedding. The room features a Flatscreen TV with HBO, microwave, fridge, free WiFi and a desk with an alarm clock. 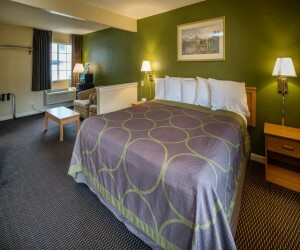 For your added comfort, our accessible room is equipped with lowered door viewers, lowered power outlets, and a lower level individual thermostat. This room type features a private full bathroom with ADA compliant grab bars and roll-in shower, hairdryer, and complimentary toiletries and plush towels. Your stay includes a complimentary continental breakfast. Our air-conditioned 2 Queen Bed Accessible room at Hotel Rose Garden is our most accessible accommodation offering ADA compliant features for handicap access. This spacious room includes a comfortable 2 queen size bed with plush bedding. The room features a Flatscreen TV with HBO, microwave, fridge, free WiFi and a desk with an alarm clock. For your added comfort, our accessible room is equipped with lowered door viewers, lowered power outlets, and a lower level individual thermostat. This room type features a private full bathroom with ADA compliant grab bars and roll-in shower, hairdryer, and complimentary toiletries and plush towels. Your stay includes a complimentary continental breakfast. Our air-conditioned 1 Queen Bed Room at Hotel Rose Garden is our most affordable accommodation and is perfect for business travelers or couples on a budget. This spacious room includes a comfortable queen size bed with plush bedding where smoking in-room is permitted. The room features a Flatscreen TV with HBO, microwave, fridge, and free WiFi and a desk with alarm clock. This room type features a private full bathroom with either shower or tub, hairdryer, and complimentary toiletries and plush towels. Your stay includes a complimentary continental breakfast. The King Hot Tub Suite at Hotel Rose Garden is our most luxurious accommodation and is perfect for a romantic retreat for couples. This grand room includes a comfortable king size bed with plush bedding and armchairs with a small dining table. The room features a flatscreen TV with HBO, microwave, fridge, and free WiFi and a desk with alarm clock. The Hot Tub Suite includes an in-room jetted tub, hairdryer, and complimentary toiletries and plush towels. Your stay includes a complimentary continental breakfast. Our 1 King Bed Suite at Hotel Rose Garden is a spacious air-conditioned mini suite. This spacious room includes a comfortable king size bed with plush bedding. The room features a Flatscreen TV with HBO, microwave, fridge, and free WiFi and a desk with alarm clock. This room type features a private full bathroom with either shower or tub, hairdryer, and complimentary toiletries and plush towels. Your stay includes a complimentary continental breakfast. Our 2 Queen Bedroom Suite with Kitchenette at Hotel Rose Garden is a perfect lodging option for extended stay corporate travelers or families/groups visiting San Jose. This spacious air-conditioned suite includes 2 separate rooms with a plush Queen Bed each and a full kitchen with dining table for four. 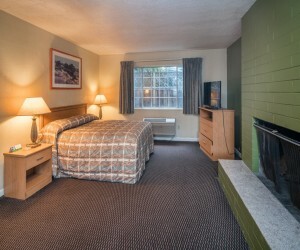 This 2 Queen Bedroom Suite can accommodate up to 4 adults with extended stay in mind. Smoking is permitted in this room. The room features a Flatscreen TV with HBO, and free WiFi and a desk with alarm clock. The kitchenette offers an oven and stove top, microwave and full fridge with a large counter space and kitchen sink. This room type features a private full bathroom with either shower or tub, hairdryer, and complimentary toiletries and plush towels. Your stay includes a complimentary continental breakfast. Our air-conditioned 3 Queen Bed Room at Hotel Rose Garden is our most spacious accommodation and is perfect for families or groups. This room type includes two comfortable queen size beds with plush bedding along with an ensuite room with a separate queen room offering privacy for one couple. This room can easily accommodate 6 adults in comfort. The room features a Flatscreen TV with HBO, microwave, fridge, and free WiFi and a desk with alarm clock. This room type features a private full bathroom with either shower or tub, hairdryer, and complimentary toiletries and plush towels. Your stay includes a complimentary continental breakfast.